So ok… I’m white. Like REALLY white. We’re talking EL BLANCO. A ragin’ caucasian! My grandparents are from Italy but I have none of that stereotypical Italian-ness. No dark hair, no dark eyes, no dark complexion, no “Roman Nose” as it were. I can’t even grow decent facial hair. So what does all this mean? I burn in the sun like a match. I have gotten Fire Engine Red sunburns in my day. Not many, but definitely a few, and some of minor burns over the years though most other times I use sunscreen. I even got a sunburn on my eye once! Now not that I’m a self-hater (not for my color anyway) but in the summer I like to get some color. Mona went to the beach today. She’s naturally less of a pinky than I am. I need to catch up, though as I told her today, we’re all the same color when the light goes out. So last Sunday was my friend “Bob”‘s kids’ birthday party at the lake near Bob’s house. So BOOM there’s my chance. Walk around with no shirt (can show off the muscles too) and at least start my tan. I used Sunblock 30. 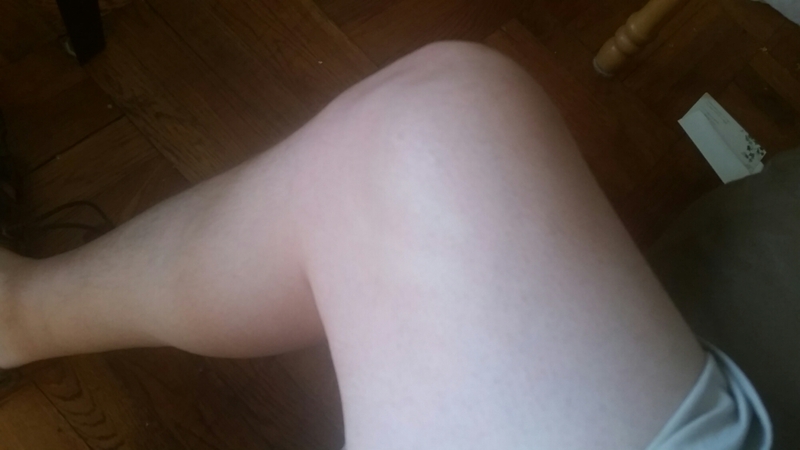 I’m cautious about protecting my skin from skin cancer but figured I’d still get slightly red, beige… off-white? Slightly SOMETHING. After the full day, you know what I got? I got STUGOTS, that’s what I got. Damn Sunblock 30 is really good. I’m still pasty as ever. It was like I had a shirt on. I was probably bulletproof too. Ugh. Ok this Sunday, Sunblock 15. It’s on. Just a note: on sunblock 15 or 30, you would still get way fried in FL. SPF 50 or better if you are trying to protect yourself! BTW – you will still get a tan on SPF 50. Haha well Northern Italy they are pretty european looking, blonde hair and blue eyed and everything, so your fam must be from up there? Yeah I know, right? Then again, when I was a kid, growing up on the Texas coast, baby oil was the “best thing” for sun protection. I’ve never heard of some of the brands she mentioned! I feel your pain. My entire family tans so easily…I freckle and burn like my Irish mother. I had a scary bout with pre-cancerous lesions after spending my first summer in the high- altitude blue skies of Salt Lake city. I was so brown by then, I switched to Crisco…the kind in the tub. I paid for it, and never abused myself again for the sake of color. SPF 30 for me ! !